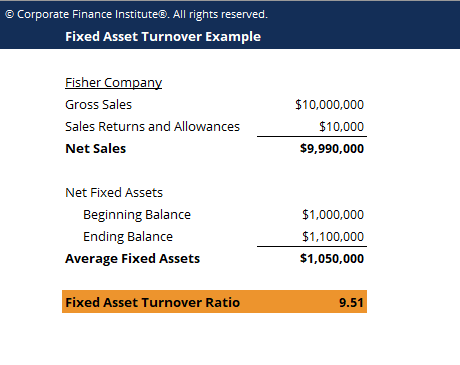 This fixed asset turnover template teaches you how to calculate the fixed asset turnover ratio using the formula: Fixed Asset Turnover = Net Sales / Average Fixed Assets. Fixed Asset Turnover (FAT) is an efficiency ratio that indicates how well or efficiently the business uses fixed assets to generate sales. This ratio divides net sales into net fixed assets, over an annual period. The net fixed assets include the amount of property, plant, and equipmentPP&E (Property, Plant and Equipment)PP&E (Property, Plant, and Equipment) is one of the core non-current assets found on the balance sheet. PP&E is impacted by Capex, Depreciation and Acquisitions/Dispositions of fixed assets. These assets play a key part in the financial planning and analysis of a company’s operations and future expenditures, less the accumulated depreciation. Generally, a higher fixed asset ratio implies effective utilization of investments in fixed assets to generate revenue. This ratio would be analyzed alongside leverageLeverage RatiosA leverage ratio indicates the level of debt incurred by a business entity against several other accounts in its balance sheet, income statement, or cash flow statement. Leverage ratios include debt/equity, debt/capital, debt/assets, debt/EBITDA, and interest coverage. This guide has exmaples and Excel template and profitability ratios. Investors, who are looking for investment opportunities in an industry with capital intensive businesses, may find FAT useful in evaluating and measuring the return on the money invested. This evaluation helps them make critical decisions on whether or not to continue investing, and it also determines how well a particular business is being run. It is likewise useful in analyzing a company’s growth to see if they are augmenting sales in proportion to their asset bases.